Will I Get Lonely Living in Mexico? One of the questions I frequently get asked living in Mexico is if I get lonely. It's probable that a lot of singles are asked that question, even if they don't live in two countries. For the first time in the history of America, more people are living single than living in a family. The typical American will spend more of his or her adult life unmarried than married, and for much of this time, he or she will live alone. I have moved to a dozen new cities in the U.S as an adult and making friends in Mexico has been easier than in any of them. Expat life offers real advantages over plopping down in Oklahoma City or Cincinnati in your 50’s with the hope of establishing a new social circle. Being an expat gives you automatic membership in at least one tribe. I am not saying this is bad, just that it is what it is and who we are, we've forgotten how to hang out. We have schedules. An hour for this, two for that. The overriding objective is how much can we cram into, excuse me I mean accomplish, in a day. In Mexico, I have had cab drivers so enthusiastic to show me a particular place that they have abandoned their schedule altogether and taken me there on the spot, even as I struggled to tamp down my alarm at suddenly being whisked off without a week's notice. I think Mexicans are more spontaneous no matter where they live. They still drop by, for god’sake, and when was the last time you dared do that? If you look closely, even Mexicans who live in the United State retain that difference in the ability to change course on a dime. Last time I was in Denver, a young Mexican-American Lyft driver took me to my Spanish practice group one morning. I invited him to sit down with us awhile (We always can use more native speakers). He did. Even socializing with a bunch of largely retirees struggling with conditional verbs was interesting enough to forfeit a fare or two. To me, that was a very Mexican thing to do. Maybe I am over-romanticizing. But I see in these circumstances a very Latin phenomenon that you will be fortunate to have surrounding you in Mexico. Mexicans are time-benders. I always feel like my Mexican friends have more time for me. Maybe they don't (They all have jobs and families), but it feels like they do. For those who choose not to learn Spanish or haven’t reached conversational level yet, expat communities are small sandboxes where everyone is expected to play together in peace and harmony. It usually works out that way too for the most part. It's Mexico after all, and we feel lucky to be here. You run into each other wherever there are cheeseburgers being grilled or blues being played. You develop a camaraderie that comes from knowing that you are all in this great expat experiment together. While expat life can make for strange bedfellows, you always have something in common to talk about - that shared bond of having looked around you in the U.S., made and assessment and then made a run for it. Most successful expats have a healthy relationship with solitude. Given the likelihood we will all be spending at least some time alone no matter where we are, it makes sense to learn how to live it richly. Avoiding loneliness in Mexico calls for developing a healthy relationship with others and with yourself. Most expats have an activity they can hole up with when things get quiet. Expats by nature exude independence. Network with people in your target cities on expat forums and Facebook groups before you move. I didn’t do this and wish I had. This will take some organization to keep people and places straight so set up a system, Excel sheets if need be. Start developing those relationships online now. Even one anchor friend in a new city can change your entire experience. Reach out - The better we get at productive solitude, the easier it is to pull in. As a guideline, mental health experts say we should make a goal of having at least three social interactions a week. Discipline yourself now to reach out enough to generate at least these few exchanges, regardless of how cozy you’ve gotten with yourself. Otherwise, when you are ready to come out of your shell, everyone will have moved on without you. The nice thing about Mexico is that the strong family networks make it easier to meet people. Mexican friends will soon be bringing their sisters and cousins with them to visit, which you will come to be grateful for. I love it because it brings people of all different ages into the social picture. Focus - If you meet someone with potential for friendship, you will need to be persistent in your approach. Don't expect too much too soon but do try to get together several times within a somewhat abbreviated time frame. I learned this technique from a master at the full-court press of friendship building. When she met a potential friend, she tried to get together with that person every few weeks for at least a few months. She has more friends than anyone I know or will ever know. Recent studies indicate we need 90 hours with a person to form a friendship. Make the transition to Mexico slowly. Spend six months or so a year there at a time (up to 180 days on a tourist visa) for a few years. People will be more interested in investing in you if you're going to be around awhile. Take responsibility for maintaining your relationships at home. Your friends might be irritated that you left. You will have to be the one to cajole, threaten, wheedle, and beg your friends to set up Skype, Google-hangouts or whatever other systems you are using to talk to your friends at home. Once everyone gets used to video calling, those calls will keep you connected. Low-season can be a good time to find full-time residents. Many expat communities have low and high seasons. In high season the city will be loaded with snowbirds and tourists. Low season provides the best time to make friends with the people who live there all year, both resident expats and Mexicans. The lives of permanent residents are different from snowbirds, who come to party and socialize. Residents’ perspectives are well-rounded from having experienced the highs and the lows of living in another country year round. They become your rock. Develop your skills for pleasurable solitude before you even leave. Meditate, find a solo hobby, read more, cook, explore new music - whatever contributes to a greater sense of personal peace. A French philosopher once said, "All of humanity's problems stem from man's inability to be alone in a room." Learn to be alone in a room. Be generous - Americans and Canadians come to Mexico for a better quality of life and a lower cost of living. Sometimes I wonder what Mexicans get out it. They have to look past our abruptness, our loudness and our sloooooow Spanish. I think it's appropriate to acknowledge their extra effort with occasional small acts of gratitude; the bottle of wine, the dinner or the “regalito” (small gift) to those who welcome you to their country. Nothing is more disheartening that being invited to some colorful Mexican social occasion, like a wedding for example, and not being able to understand a word of what anyone is saying. It doesn’t take that much Spanish to make native friends, especially if they have some interest in learning English. Even if they don’t, Mexicans are so appreciative of the effort you’re making by learning the language that the goodwill you generate will pay off a thousand times. Experts estimate that it takes a 600 hours to learn a Romance language like Spanish. Take an hour or two a day on a regular schedule and get on with it. It will pay dividends in every aspect of your life here. Take these steps and you will be alone only when you want to be. Hola, My name is Kerry Baker and I'm a partner with Ventanas Mexico, which provides resources and insights to people considering retiring to Mexico. 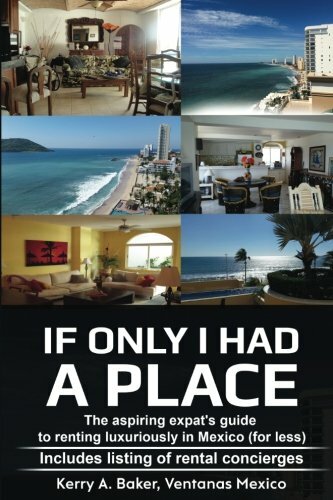 Most recently I published "If Only I Had a Place" on renting luxuriously in Mexico for less. This book gives you a system of finding places year after year, and includes a listing of rental concierges to help you vet places that you find online, something you will always need to do. 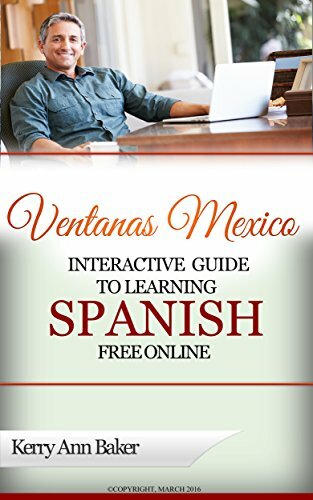 I also wrote the "Interactive Guide to Learning Spanish Free Online." The Interactive Guide takes you directly through interactive links, to the best free features for learning Spanish on the web, organized into lesson plans. The book takes you via links to the best learning sites on the web, most of which you'd never find in a Google search. You can use the book's lesson plans or create your own unique lesson plans every day. Use with your laptop (I love my Acer Aspire! ), e-reader or tablet, like the Amazon Fire. Do You Have $367,000 to Cover Health Care Bills in Your Retirement?